There are days, when with work and everything else, Amit and I get time to say about 5 lines to each other. So we’ve been making conscious efforts to set aside time for the two of us. It really isn’t a full-blown hit the town, let’s go crazy type thing – that ship has sailed if I am being honest. =)) We love eating out, so we try to coordinate our schedules and meet for lunch between work. Little things like grabbing coffee in the evening or catching a movie in the night after Zoe is in bed are also fun. Few days back, we were able to actually carve out an entire day to spend time with each other and we drove down to Newport. It’s our absolute favorite town in New England, we go there every chance we get. 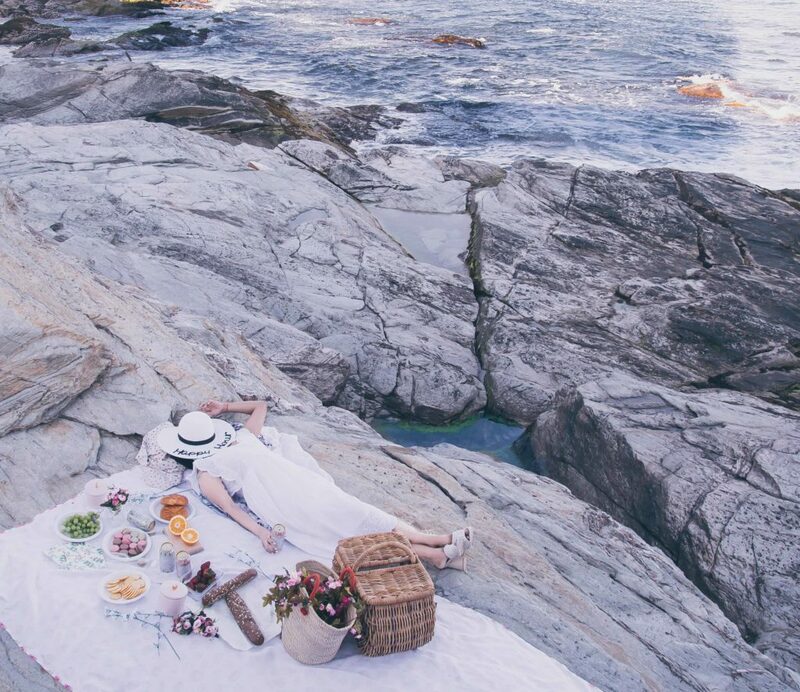 With nothing specific planned – we biked a bit along the ocean, grabbed a bite, took a lazy coffee break and then at sunset, found the best seats in the house – aka on a rock with an uninterrupted view of the ocean. 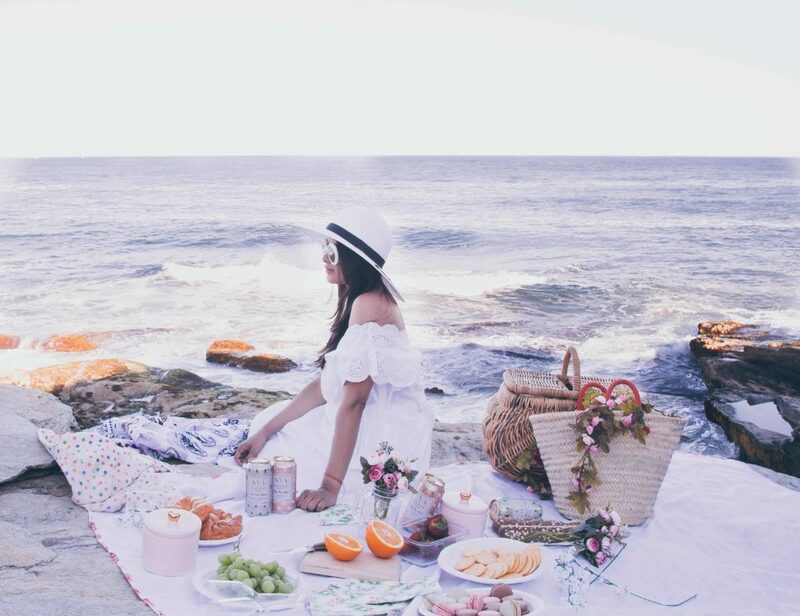 It was the perfect setting for a picnic. 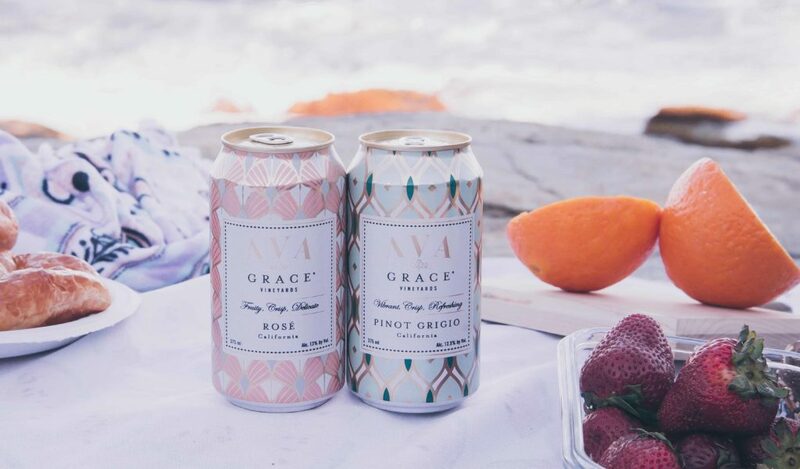 I was recently introduced to AVA Grace Wines that are also available in cans, making them perfect for outdoor picnics. I brought along the Rosé and Pinot Grigio in my basket. I am no wine connoisseur by any means, but the wine tastes like high-end, luxury wines and the price tag, less than $5 for a can. They can be found at various retailers as well as online. I am a Rosé girl all the way and the AVA Grace Rosé can is filled with fruity notes of berries, apricot and watermelon. The packaging is equally beautiful as it is delicious. 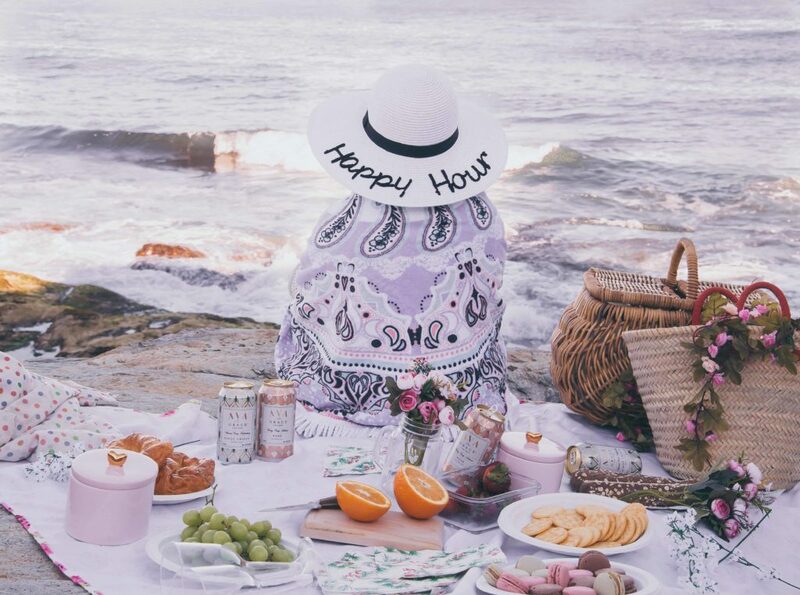 Summer plans on the beach, backyard parties, these are going to be fun to wine down with! 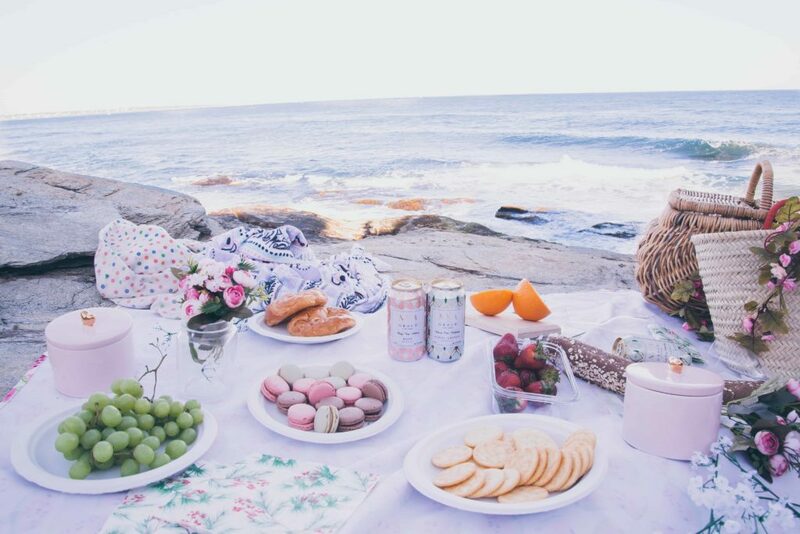 Sounds heavenly to have a fun day together. I totally empathize with this post. This wine sounds like the perfect thing to bring along. 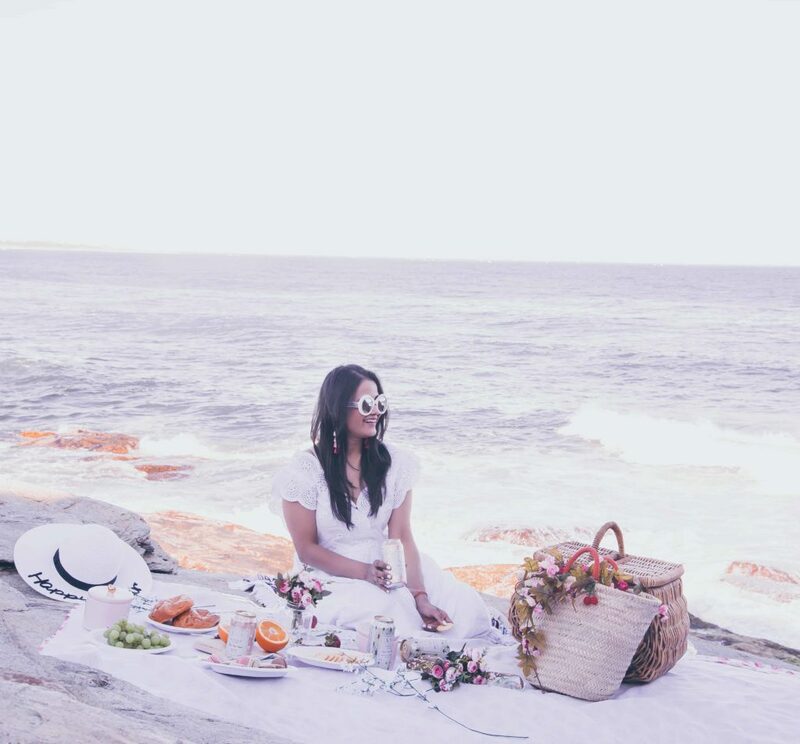 How beautiful and dreamy does this setup look?! 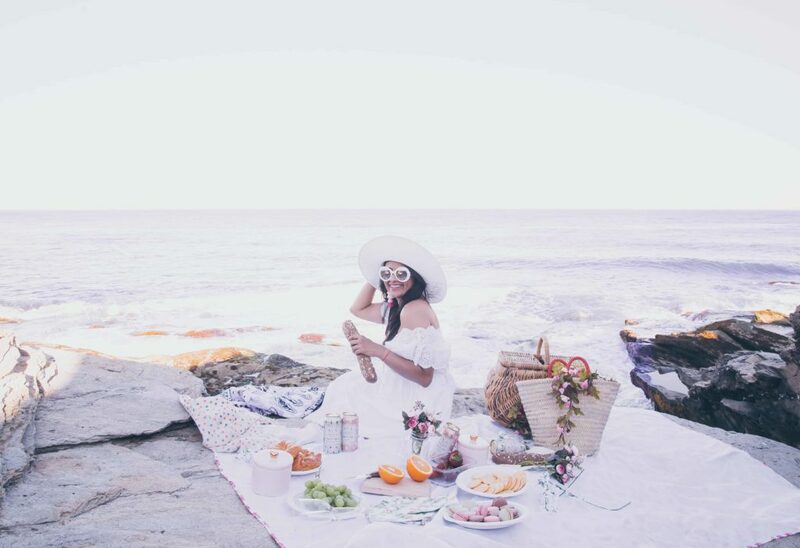 Thanks for sharing, girl; it makes me want to have a beach picnic asap! Such a beautiful shoot! Your photos are amazing dear, nicely done!